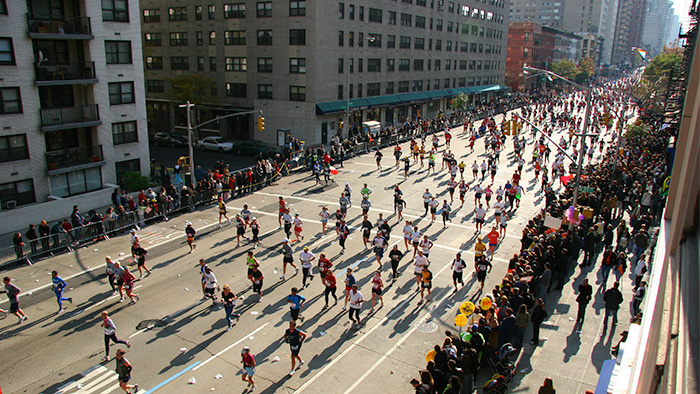 Whether it’s your first or your fifth, a fall marathon is the culmination of all your spring and summer training. Perhaps you’re wondering if your training is on track, or if your goal race pace is attainable. Here are some tips I’ve learned over several years of coaching and racing to help you ace your race this fall. If you’re putting it all on the line, you should take some time to review the course and make sure you have trained for the demands of your race. If it’s a hilly course, then have you trained on hills and done a few hilly long runs? Look back at your last build up – have you made worthwhile changes since then, and worked on your weaknesses? Creating a progressive training program is hard to do. You need to find workouts that will challenge you, but also lend insight to your progress. You can use a local 5K, 10K, or half marathon as a good predictor. When you reflect back on your best race, what was your defining workout regimen beforehand? Did it have you running a good portion of your marathon pace? If you find yourself running your marathon pace for every long run, have you set too easy a goal, or, are you training too hard for the results you want? Specific endurance workouts are a great way to inject pace into your long runs or weekly workouts to make sure you’re ready for the demands on race day. Running a long section at goal race pace is good, but how else can you mimic miles 20 through 26 in your training without running that far? Consider also adding in hills or long downhill sections that mimic your goal race course. Coupling a specific endurance workout with a poor fueling strategy is a recipe for disaster! Use an endurance workout to test fueling and hydration strategies for race day. This is your chance to try new gels, and regular hydration, to see what works for your system and physiology. It’s far better to fail a workout than leave fueling to chance on race day. When possible, test yourself with similar conditions to what you’ll confront on race day. Make note of went well or what didn’t. Don’t just look at what you did in your workout; what did you have pre-workout (all the way back to the meal you ate the night before)? Also, pay attention to what you can learn from your recovery after the workout. A general fueling strategy: Every 40 minutes, drink to thirst or take a sip after every song. But like I mentioned earlier, this formula will not work for everyone! So, what should you do if you live somewhere hot but your goal race is somewhere cool? It may not be feasible to run your goal pace in major workouts. You would want to take a closer look and use workouts to determine a goal heart rate range for your race pace, and utilize this as your “race effort” on hot days so that your body learns the physiological demands on race day. This is not perfect, especially if pace is significantly slower; leg speed may be lacking in comparison to aerobic ability. However, it is the safest and most effective way to train in the heat. You will also need to hydrate and fuel more regularly to keep up with your body’s cooling demands. The opposite is also true. If you live where it is cool and will race in the heat then consider adjusting your training so that you are acclimatizing to the heat. The demands put on the body by heat are intensified for every degree over 70 degrees Fahrenheit. We’ve all felt that itch, the rub, the dreaded chafing one can experience on race day; the pressure of blisters, or the abrasiveness of salt on skin. All of these feelings only add to the pain your legs are going through on race day, breaking concentration and putting you further from your goal. So how can you prevent all but the leg pain? Do at least one dress rehearsal of your race day by wearing the same clothes you plan on wearing, and testing them at nearly the same temperatures and conditions you expect on race day. This is an opportunity to see how that new tank top or shorts fit. Make sure it fits comfortably after 16 miles, not just the first 16 minutes. The details matter! Do you plan on wearing deodorant on race day? What about a hat and sunglasses? Will you race with headphones? Do you wear a race belt on race day but not in training? Consider all the factors, as they can play major roles in your comfort—or provide a major distraction on race day. If you plan on racing or flying for your event, pack your full kit in your carry-on bag. This ensures that everything makes it with you! It’s true you could replace it all at the expo, but, the anxiety and pressure of doing so the day before would create unnecessary tension. This can be eased by simply packing it along with you. Light gloves – perfect for cold hands, and an impromptu tissue or two (we’ve all been there). Arm Warmers – Even if you don’t race in them, they are a great way to stay warm in the corral. They’re also easy to throw off after the first few miles so they can help ward off the early morning chill without having to pull a shirt over your head. Sunglasses – I always pack these, squinting is zero fun! Hat or Visor – It keeps the sun and sweat out of your eyes. Two things you don’t want in your eyes at mile 20. Knit cap – if it’s going to be below 40 at race start this is a must, you’re losing heat through your head—keep yourself warm and happy! Another easy to throw item! Lube – Pick your favorite, I always hit the pain points. Back of the armpits, inner thighs, feet, in between toes, balls of my feet. Trash bag – The black plastic kind! Not only an easy way to pack all the stuff in your bag, it makes a great way to stay warm on race morning if you find yourself in a pinch. These are just a few of my recommendations to make your race day a success. Just a few pieces of planning ahead that can add up to a great day of running. However, failure to prepare can lead to a very tough 26.2 miles. A saying as old as time stands true: “Fail to prepare, prepare to fail.” Use these tips to help have your best possible race day!